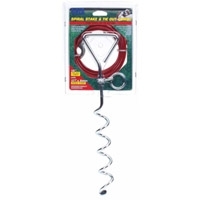 Coastal Titan Spiral Stake & 15' Heavy Tie Out Combo Up to 80 lbs. Increase your tie-out sales with Titan cable combos. Item #89010 combines a 17"" spiral stake and 15' tie-out. Item #89011 is a 20"" dome stake with 15' tie-out. Designed to hold dogs up to 80 lbs., these combo units offer your customers everything they need: sturdy construction, easy installation and a very favorable price. Unconditionally guaranteed and attractively displayed on a durable header card, Coastal Pet Products new cable combos are designed to sell.